Join us for a weekend retreat at the Maryknoll Initial Formation Residence in Chicago. Located in the Hyde Park area just opposite Lake Michigan it’s a great location with parks everywhere that allow you to get out and enjoy the Windy City! This fall retreat will take place over Columbus Day weekend beginning on Friday evening October 5th and ending on Sunday at noon October 7th. Joining us will give you a good opportunity to get to know Maryknoll while meeting our candidates and formation team, seeing where they live and visiting the Catholic Theological Union where they study. 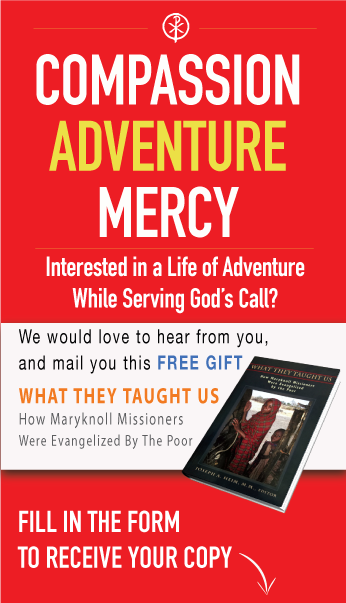 Consider becoming a missionary priest or Brother and come join us for this weekend event! Contact Fr. Mike Snyder at msnyder@maryknoll.org for further information! The Grunt Priest, Father Vincent Capodanno, M.M. Meet Father Peter Latouf, M.M. Copyright © 2019 Maryknoll Fathers and Brothers.